So...here I am...one month later and back on the blog. When I wrote my farewell post, I had an inkling that I might be back in 2019 or late fall at the earliest. But, during my month-long hiatus, I realized that "misslaurenalston" is such an integral part of my identity. There are numerous other factors that brought me back here, but instead of listing them all out I'd rather get into my summer beauty essentials. Like everyone else, I've always had products that I preferred to use in the summer because of the heat, sweat, and humidity that come with June, July, and August. However, when I went to Hong Kong in June I experienced humidity like I never had before and what's worse, I limited space to pack skincare and cosmetics. 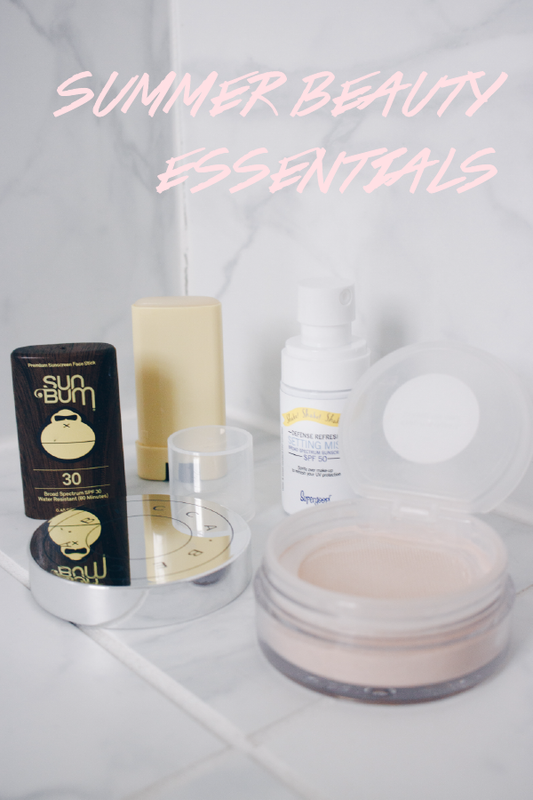 I obviously packed more than five products, but today I'm sharing the five products that I would have struggled without! I cannot stress enough how important it is to always protect your skin from the sun. Even if you're spending the day at work, school, or in the car; it's imperative to apply a layer of SPF. Whether you're terrified of the health consequences like skin cancer, the cosmetic consequences like hyperpigmentation and aging, or both (like me); sunscreen is the #1 most important product to have. My favorite is Sun Bum because it doesn't have an awful smell, it's 100% vegan & cruelty-free, and its broad spectrum (meaning it protects from UVA and UVB rays). I use the SPF 30 face stick on my face every morning and throw it in my purse if I'm on the go. For my whole body, I use the SPF 50 original sunscreen. 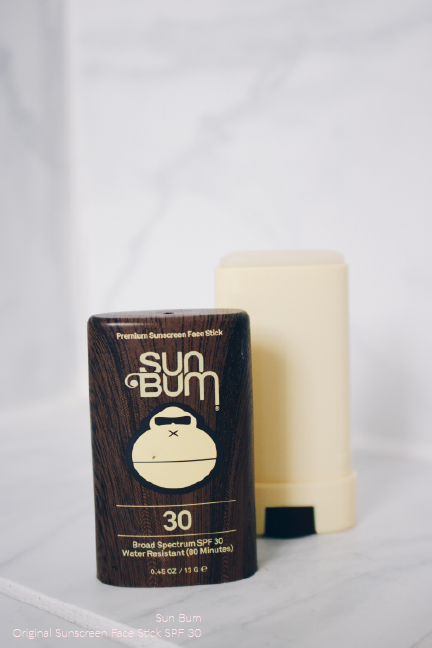 You all know I'm loyal to Burt's Bees in the chapstick department, but my sister has the SPF 30 pomegranate lip balm from Sun Bum and I always borrow it from her when I'm going to the pool or beach. I don't wear that much makeup in the summer; mascara, highlighter, and blush are enough for me. 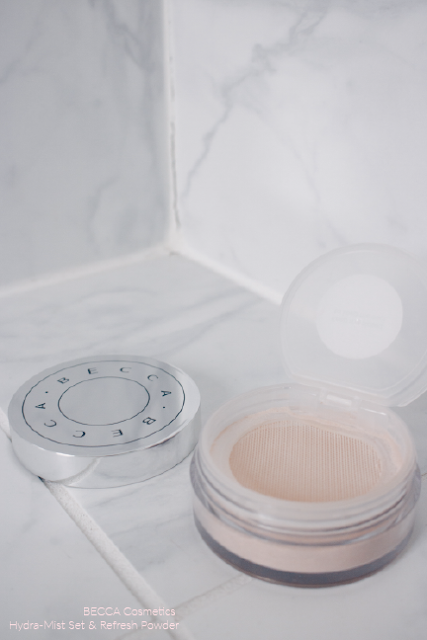 When I am wearing makeup, I always wear the new BECCA powder because, not only does it set your face and mattify your skin, it has some kind of crazy technology that makes it feel like a mist when you dust it on. No joke, the feeling that I get when I spray my Mario Badescu rosewater mist is the same feeling as when I dust on the Hydra-Mist powder. Wild. I actually didn't have this product in Hong Kong, my sister gave it to me as a birthday present when I got back, but I'd had this back in June...two words: game. changer. Ok, here's where I come clean; I set my face at least 2x a day. After I use the BECCA setting powder, I spritz my face with the Supergoop! Defense Refresh Setting Mist. Why, you may ask? Well, I love a good spritz, but more importantly, I crave SPF. 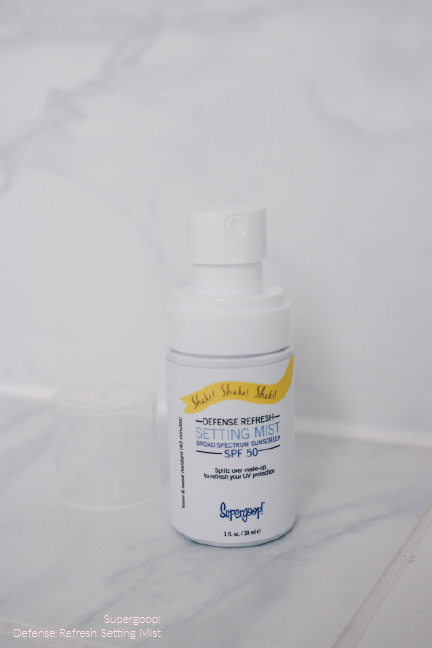 This setting mist has broad spectrum SPF 50 and goes on over your makeup. So even though, I wear the Sun Bum under my makeup, this adds even more SPF on the surface of the skin. Plus, I'm terrible at remembering to reapply SPF after a few hours, and misting makes it easy, fun, and convenient. I recommend the smaller, 1 oz bottle because it's easy to travel with and fits in the smallest of bags. I threw this into my cart at the last minute at Target the day before I left and I'm never been more grateful for an impulsive purchase. The humidity in Hong Kong was absolutely insane, so much so that I would have had clown hair without this product. I used it to smooth down the hair at the front of my head, which was especially prone to frizziness, making it easier to brush my hair and put on a headband. Something as simple as slicking back the hair at front of your head can take a look from messy to sleek. Also, since I've been home my mom use this product to tame the hair at the front of my head when she's french braiding it. My entire family is a big fan of the C Booth body butters, but I especially love the Egyptian Argan Oil scent for summer. It's obviously moisturizing and I love that it contains Vitamins A & E, argan oil, and kola nut that rejuvenate the skin and give it a glowing, radiant shine. Jeans are my go-to, but when it's too hot for me to handle I love a romper, skirt, or dress like the one I wear when I travel. Applying this lotion right out of the shower means that I don't have to worry about my skin for the rest of the day, because I know that it's shining, shimmering, splendid (I couldn't help myself)!